Check back next Thursday to see our picks for Week 4, and how the players performed that we picked the week prior. See the bottom of this article for details. Wichita Heights and senior quarterback K'Vonte Baker are coming off an emotional loss to Bishop Carroll in Week 2. Baker had two touchdowns called back, which would have given him five total touchdowns against the reigning 5A champions. He should have plenty of opportunities to take out that anger on a struggling Dodge City team. The Rossville senior quarterback has accounted for 578 yards of offense as a dual-threat this season with 292 rushing yards and 286 passing yards. Carver also has five combined touchdowns on the year and had over 200 yards of offense last week in the 17-14 loss to Silver Lake in the "War on 24" match-up. Could expect a big night for Carver against Rock Creek this week. Foster is off to a good start to the 2018 season. He has thrown for 633 yards and six touchdowns while completing 61 percent of his passes without throwing an interception. The Falcons take on an improved Shawnee Mission Northwest in a battle of 2-0 teams. The 6-1, 185 pound junior quarterback is an accurate passer and potent running threat for Beloit in his second year as the starter. Gray opened the season with 186 yards and three TDs passing and 37 yards rushing and another score on just three carries. His numbers slipped in a heartbreaking week two loss to league rival Southeast of Saline in a game played in sloppy conditions. Friday, the Trojans square off with a Minneapolis squad off to their best start since 2014, and Gray and his teammates will look to improve on last week's mistakes and improve to 2-1 on the season. Coming off a monster year in 2017 where he caught 71 passes for 1,058 yards and 20 touchdowns to earn All-Eight-Man Division II first-team honors, Koch has picked right up where he left off. And the argument could be made he's even better in 2018. Through two games, Koch is on pace to obliterate the single-season record for touchdown receptions, which is 29, set by McCracken's Kellye Irvin in 1979. Koch had 18 catches for 289 yards this year with 10 of those grabs going for touchdowns -- five in each of Axtell's two wins over Beloit-St. John's and Blue Valley-Randolph. Koch may start to see a bit more attention from opposing defenses, but then again, he already should have had their attention so it may not matter much. Onaga has given up six TD passes in its first two games, so Koch and quarterback Quinn Buessing should be in store for a big night. The Wichita County Indians have begun the season with impressive wins over Pretty Prairie and Sharon Springs-Wallace County. The Indians beat Pretty Prairie 66-8 to open the season in a game played at Otis-Bison, and opened their home schedule with a 54-6 victory over Wallace County last week. Quarterback Kayde Rietzke has been the catalyst for the Indian offense thus far. The sophomore signal-caller has passed for 276 yards and seven touchdowns, and added 209 yards rushing and five more scores. Rietzke accounted for five touchdowns in Week 1 and seven scores last week. He’ll need another big performance as Wichita County hosts Logan-Palco in Leoti on Friday. The Indians have now won ten games since the start of the 2016 season after having post four consecutive 1-win seasons from 2012 to 2015. Wilson has flourished in the first two games under first-year coach Matt Fowler, the former highly successful Spearville coach. Wilson has rushed 41 times for 293 yards with five scores. He has helped the Indians rush for 556 yards and nine TDs with 6.9 yards per carry. Wilson has passed some in the single wing with 4 of 5 passing for 52 yards. Wilson has significantly elevated his performance from last year when he had 26 carries for 54 yards and caught three passes with 49 yards. Fowler, including his time at Spearville, has won 42 straight regular season contests and has helped Oswego already double last year’s win total. Oswego is off to its best start since 2014. All of the Indians’ rushing yards come from non-seniors. Oswego, from the Three Rivers League, in its first year of eight-man football. The Indians opened with a 54-14 road win versus rival Chetopa, and earned a quality win at Marmaton Valley, 30-22. Marmaton Valley was 6-3 last year. Oswego plays host to struggling Altoona-Midway (0-2) this week. This is the first matchup between the teams since 1999, according to kansasfootballhistory.com. Tank Young has been dominant over the first two weeks for Randy Dreiling's Aquinas squad. Young rushed for over 250 yards in week 1, and then bounced back in week 2 with a 151-yard performance on just seven carries and three scores. 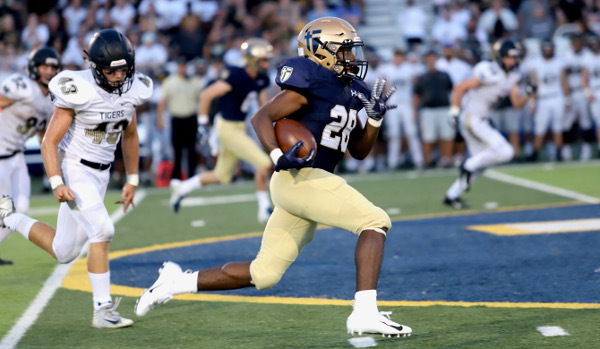 Aquinas will play a Blue Valley Northwest team that has given up at least 29 points in their first two games. Look for a big performance from Young and the entire Aquinas team.